Screen Space is about to be revived. Stay tuned for new features, posts, new podcast episodes (including a special series), and a focus on usability and user experience. This blog was put on hold as I transitioned from academic to industry. Then life happened (including a baby). 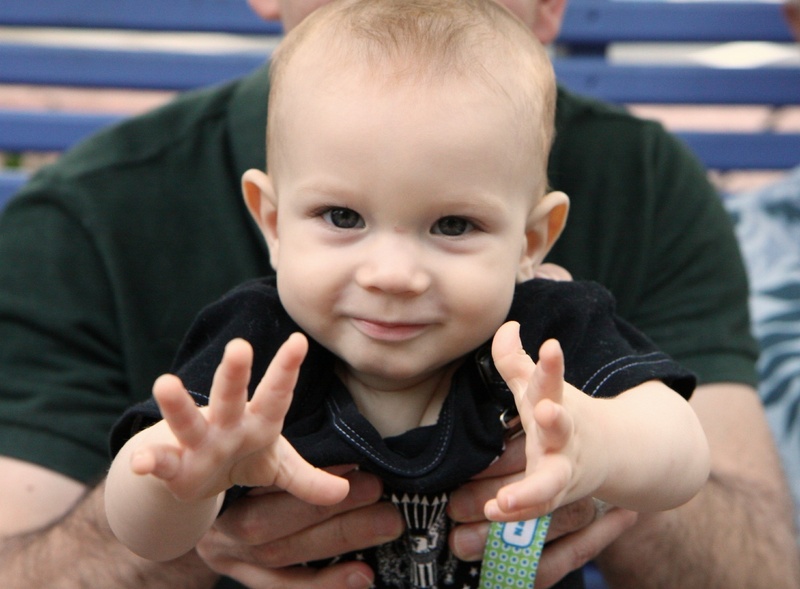 Now I have a firm foot in industry and a baby who is quickly becoming a toddler. It’s time to bring back Screen Space. Image by Jennifer L. Bowie with full Copyright. Before the Mac, the focus was not user-centered, it was function (or system)-centered. Apple brought computers to the greater people and embodied the user-centered design principle in a way previously not seen in computers. They had a diverse team: a drop out, a person in an MD PhD program, musicians, an artist, and an archeologist allowing for different perspectives and ideas from a diverse user group—instead of the normal computer scientists designing for computer scientists. These principles exemplify why I got into usability and the NPR story was a pleasant reminder of the best parts of my job. Links: Steve Henn “At 30, The Original Mac Is Still An Archetype Of Innovation” http://www.npr.org/blogs/alltechconsidered/2014/01/24/265238567/at-30-the-original-mac-is-still-an-archetype-of-innovation. January 24, 2014. Are female users paving the way for more women in tech? Can female users chance everything? “Is there reason for optimism for women in technology?” is a brief but interesting discussion of some changes in the “gender” of the technology industry. As the article points out, there are several recent changes that are or may lead to increases in the number of women working in technology—from angel investors and start-ups in Silicon Valley that promote gender equality to a large percentage (70%) of online purchases made by women. However, all is not blooming pink—the article cites a USA Today article that shows “just 11.7 per cent of computer science graduates were women in 2010-11.” So, all is not yet perfect. I agree with the article that we need to find ways to make computer science and also in tech fields more obvious and visible career options for girls. I think one of the most interesting points is about female users. As 70% of the online purchasers, there is obviously a vast need to create technology specifically for this user group. The article touches on this point—“Female users are the unsung heroines behind the most engaging, fastest-growing and most valuable consumer internet and e-commerce companies.” Not designing for such a dominate group is ridiculous. One of the best ways to design for this group, beyond of course employing usability (see for instance Screen Space Episodes 10–12: User-Centered Design 101, Usability & Usability Testing 101, and Usability & Usability Testing 101 Part 2—Selecting Users) is to employ females as designers, coders, writers, researchers, and in other technology roles. Perhaps the financial advantages of employing females to design for females will force industry to find more ways to bring females into the technology fields. So, female users—especially female shoppers—may change the demographics of the technology industry. Tip of the Day: Avoid Courier, unless you want to look like a relic! Avoid Courier, unless you want to look like a relic of a bygone age! As a symbol of typewriters and the 20th century, Courier is a dated typeface, and thus it can give texts a dated feel. Due to its use as common typewriter face, it reminds one of typewriters and business and government in the mid to late 20th century. It has the same ethos as memos and carbon paper. Courier gives a feel of an outdated time and obsolete technology. Unless you are writing a screenplay, writing computer code, or making columns of text, or writing in the 1960s (or want it to look like you are), avoid using Courier! To find out more, check out my recent post: Typeface of the Week: Courier the typeface of the 20th century, typewriters, and screenplays. What lead to the writing or design of this text? Why are you writing or designing this text? What constraints do you have on this text? How does this impact your writing or design? What environment are you writing or designing this text in? How does this impact your writing or design? What culture or society are you writing or designing this text in? How does this impact your writing or design? Environment and setting: What environment and setting will your audience use your text or design in? Constraints: What constraints is your audience under while using your text? Tools and Technology: What tools and technology will you user have when accessing your text? Culture: What culture or society are they reading or accessing this text in? Other considerations: What other things about the audience’s context of use impact use? What can you do about these things? Once you have determined your purpose and the purpose of your audience, you can design/write your website, blog, or digital media to work in and for these contexts. There are many different versions of Courier available for computers today. Courier was not designed for screen readability, but was often used as a default replacement for a typeface not available on the computer trying to access the text. “Courier New” is the default monospaced or modern generic font family for Windows and “Courier” is the default monospaced or modern generic font family typeface for Macs. Courier is a monospaced typeface, which means each character takes up the same amount of space—the “i” takes up the same amount of space as the “m”. With proportional (or variable-width) typefaces, like Georgia or Verdana, each letter takes up a proportional amount of space—wider letters take up more space, narrow letters less. So, in the proportional typefaces, the “i” takes up much less space than then “m”. Monospacing is common on typewriters, because each typewriter key took up the same amount of space. Thus, monospacing is a typewriter convention and a relic of typewriters. As a symbol of typewriters and the 20th century, Courier is a dated typeface, and thus it can give texts a dated feel. I was recently told that one should never use Courier in a résumé because it makes the résumé look like it was written on a typewriter; this making the applicant look old-fashioned and outdated. Courier is now used when columns of characters need to be exactly aligned (because it is monospaced, see below) and to represent computer code in texts. It is also the required typeface for screenplays. Roland Stroud, in a fascinating discussion of Courier, gives us a good reason for the continued used of Courier in screenplays, “Because it is a monospaced font, its use in a standard screenplay format allows a fairly accurate estimate of the time that one page will equal out to on screen.” Otherwise, I would not recommend using this typeface on screen or for print, due to the dated style. Width and weight: Wide and light weight. Courier is the widest of the typefaces I have covered so far in my Typefaces of the Week. In fact, it is so wide that it is wider in 12 points than most of the typefaces I covered (except for Verdana, a wide face) set in 14 points. Legibility and Readability: Highly legible. The monospacing decreases readability and the thin strokes further decrease readability online. Voice-over and ethos: Due to its use as common typewriter face, Courier has the voice of a 1960s business person, secretary, or government worker. More generally, it reminds one of typewriters and business and government in the mid to late 20th century. Think memos and carbon paper. Vanderbilt suggests it has the “voice of raw clarity and transparency” and “it has come to serve as blunt shorthand for secrecy or for the chilling revelation brought to light.” So, it is both clear and secretive. Since it was the standard typeface of the U.S. State Department until 2004, it carries a government bureaucracy attitude. While it comes with a professional business and government ethos, it gives a feel of an outdated time and obsolete technology. Typefaces that contrast well with it: Courier is a difficult face to find strong contrasts for because it utilizes aspects of both serif and sans serif typefaces. It has the serifs of a serif typeface, but the minimum thick/thin transitions of a sans serif. The best contrasts will be faces with radical thick/thin transitions, such as those in the Modern category (Bodoni, Elephant, and Bernard MT Condensed). The calligraphic flow of the Oldstyle faces (Book Antiqua, Bookman, Californian FB, Calisto, Centaur, Garamond, Goudy Old Style, and Palatino) also provide a decent contrast. Typefaces that provide conflict: Many sans serif faces are simply too similar with the minimal thick/thin transitions. So avoid faces in this category such as Arial, Helvetica, Verdana, Tahoma, Century Gothic, Calibri, and Bell Gothic. Of course, also avoid other slab serifs like Copperplate. Likely audiences and uses of the typeface: Anyone who read documents produced by the U.S. State Department prior to 2004 has read this typeface. Also, many documents typed on typewriters between 1955 and the late 1970s (and even later), were in Courier or a similar face. Current uses, as mentioned above, include representing code in texts, screenplays, and when the text columns need to line up. Other uses could be texts when you want a certain retro feel of business or government in the 1950s to 1970s or when you want a typewriter aesthetic. Good two for texts/designs meant to be reminiscent of the 20th century (especially mid to late 20th century). It is a better print than screen face, but its vast width means it will take up extra space (thus paper). Not recommended for people with visions issues. And, please do not use Courier when writing to me; I do not like the aesthetics of Courier. X-heights: the height of the lowercase x compared to the uppercase letters. The higher the height of the lowercase x, the more readable the typeface. Ideally shoot for more than 50% for print and higher for online readability. Width and weight: Widths is how wide the letters in the typeface are. Weight is how heavy the typeface appears on a page the thickness of the strokes of the letters. A heavy typeface will look black and make the overall page darker, a light typeface will look lighter and make the overall page a shade of gray. Structure: how the face is built including thick/thin transitions, types of strokes, and more. If you were building the typeface out of materials, what would you use? Pipes? Fences? Thread? Voice-over and ethos: Voice over is the voice of the typeface or the style of the typeface. What style does the typeface suggest. If the typeface could talk, what would it sound like? Is it loud? Sassy? Quite? Formal? Would it be a valley girl or a New Your City business woman? Ethos refers to the authority of the text. When would this typeface be appropriate? Contrast: For good design you want to use typefaces that contrast. Clearly distinct faces contrast and create a strong design. If the faces are similar neither will “pop” and the similarities may look like a mistake and not intentional. Good contrasts are serif typefaces and sans serif typefaces. Conflict: The opposite of contrast. Two typefaces (or other elements) that are so similar they are disturbing (they “conflict”) and not contrasting, thus creating a weak design. Example: Times New Roman & Garamond. Have you considered a job in usability? Convinced after all my posts abut UPA last week that usability rocks? Want to make the world a better place? Or at least the web? Have you considered a job in usability? There are also links to national and regional resources. Pretty cool. Check it out! Why consistency and ease of learning are vital—even in bathrooms. So, here I am at a conference for usability and user experience, with usability more on my mind than it is even normally. Deep in thought on some very important usability issue, I am sure, I found myself starting to walk into the doorway of the men’s bathroom. Luckily I noticed quickly what was happening. But what is key is why it happened. This is a design problem, not an oblivious conference attendee problem. The restroom I had been using was set up to have the women’s on the right and the men’s on the left. But this one had the women’s on the left and the men’s on the right! At first I thought this may be a floor thing, as I had been using restroom on one floor and this was a different floor. This would still be a bad usability problem, but it would make some amount of “sense” (or not be quite as odd). But, no. 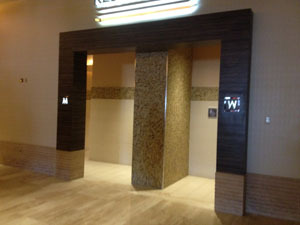 The two bathrooms in the conference area (on the same floor and a short walk from each other) switch the left/right location of the women’s room. Check out the two images. 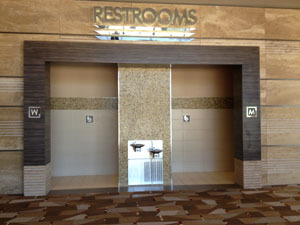 The left/right positions of the restrooms is inconsistent throughout the resort. This is a perfect example of why consistency and ease of learning is a key part of usability. We train ourselves to do something one way, and if the system changes… well… we may find ourselves walking into the wrong restroom. I do wonder how many other people have had this problem. Considering the number of bars and the casino in the resort, this could be quite an issue! Tip of the Day: Consider Purpose! •	Why do they come to your site, blog, or digital media? What are their reasons? •	What are their goals or objectives when they come to your site? •	How does your site benefit your users? •	What task or tasks are they coming to your site to complete? •	Why do they choose your site, blog, or digital media? Once you have considered your purpose and the purpose of your audience, you can design/write your website, blog, or digital media for these purposes, making it more effective for you and your audience. To find out more, including descriptions of these purpose areas to consider, check out: Screen Space 22: The Rhetorical Situation Part 2—Purpose and Context. You may also find the Purpose Analysis Tables helpful. I’m at the Usability Professionals’ Association Conference! This week, I am attending the Usability Professionals Association (UPA) 2012 Annual Conference! The theme this year is “Leadership.” I will be tweeting and blogging the conference, so you can share some of the fabulous experience and information. You can follow everyone’s tweets with the Twitter hashtag #UPA2012. I am excited to finally attend. As an academic, I simply could not afford the conference. As a professionals’ conference the registration was most of my travel budget—let alone getting there, staying there, and eating. I am quite happy my wonderful employer The Home Depot is paying for this this training experience.